Do Y'all Want to See My New Lil Pink Ewe..I Bet Ewe You Do! Y'all know that my favorite color is pink? Well if ya don't I'm going to have to hit ya in the head! ....Dong! 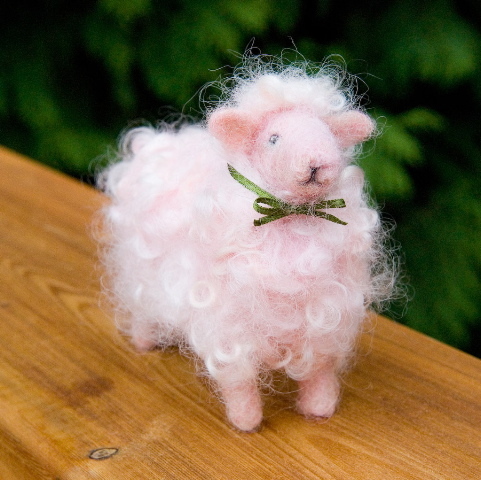 Anyway....I had Laurie (the best darn fiber artist in the world) of Woolpets to make me a PINK sheep (ewe). I didn't give her a picture or any ideas, just told her I wanted her standing and in pink. This is what I received.....I LOVE her. Of course her name is Ms. Pinky. Ms Pinky fits perfectly into my needle felted sculpture collection of sheep. I wanted to tell y'all that Laurie has a brand new spank'n blog at Woolpets. Go make a comment and make her welcome in this world of bloggers. You can either click here Woolpets which is her home shop or you can click here Woolpets @ Etsy for her Etsy Store. Remember she can even make your pet from a picture.